NEW BEDFORD — When Andrew Rencurrel finally fills his cargo hold and heads home after days raking the bottom of the sea, the captain of the large trawler makes a call that triggers a series of e-mails alerting state and federal officials, local labs, and dozens of others closely monitoring his lucrative haul. Over the past five years, federal officials have allowed the Sea Watcher 1 to scoop up millions of pounds of clams from the bountiful waters of Georges Bank, something fishermen throughout the region have been banned from doing for more than two decades because of concerns about food poisoning. Now, after federal officials have deemed the five-year trial a success, they’re allowing other fishermen to harvest the prized clam beds that for years provided the meat to fill chowder bowls around the world. 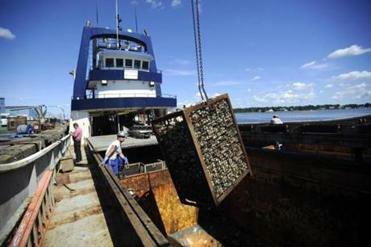 A container of clams was unloaded from the Sea Watcher 1 in New Bedford. molluscan shellfish in Georges Bank in 1990, when state and federal officials found a spike in toxins that cause paralytic shellfish poisoning, which can be lethal. Fifteen years later, the agency barred clamming in an additional 15,000 square miles of seabed between much of the Massachusetts coast and Georges Bank when a massive bloom of single-celled algae that carries the toxins extended from northern Maine to Nantucket. The scourge of the so-called red tide has halted business for thousands of clammers, oyster farmers, and mussel harvesters, at a cost of hundreds of millions of dollars over the years. “There was great concern that we were closing shellfish beds and not doing anything to reopen them,” said Stacey DeGrasse, a marine biotoxin specialist at the US Food and Drug Administration, noting scientists have yet to understand what has caused the large algae blooms in recent years. So DeGrasse began working with local fishing companies to find a way to resume harvesting the large crop of clams while minimizing the risk to the public. Over the past eight years, she and the companies have developed a kit that fishermen can take to sea and a series of procedures to test and certify the clams are safe to eat. home nearly 400,000 pounds of clams from every trip to Georges Bank. They’re allowed roughly 30 million pounds a year and hope authorities will allow them to triple their take in the coming years. Fishermen working independently and in other areas that have remained open to clamming, such as the rich shoals south of Nantucket, earn on average about 22 cents a pound. The owner of Rencurrel’s boat, Sea Watch International, earns considerably more — between $2 and $4 per pound, depending on the species of clam and other factors — because the company packages the clams and sells directly to major retailers. The program works like this: Rencurrel uses GPS and a special video scope to identify where he wants to cast his dredge in an area called Cultivator Shoals, the only section of Georges Bank where federal authorities have sanctioned clamming. When he finds the right spot, he must spend several hours dropping his dredge in the corners and center of a grid where he wants to fish, collecting a dozen sample clams from each corner that his crew shucks, mixes in a blender, and tests using the FDA-approved kit. Kits were used on board and on the dock to test samples for levels of paralytic shellfish poisoning before and after the mollusks were harvested. If any sample has more than 40 micrograms of the toxin per 100 grams of shellfish meat, he must shift his grid several miles and collect additional clams to test. It takes 250 to 300 micrograms of toxin to make people ill. Rencurrel said he can’t recall the last time he found clams that exceed the toxin limits. When his cargo hold is full after harvesting, he returns to port, where federal officials monitor similar dockside tests and review the results taken at sea. His crew then fills 11 bags with a dozen clams each, which they send by FedEx to an independent lab that does its own testing. None of the clams can be released for sale until the lab certifies all are safe. 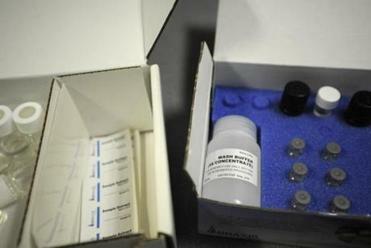 DeGrasse said no clams brought to port have tested positive for elevated levels of toxins since 2008. Satisfied with the new procedures, the FDA this year began training dozens of other fishermen in the area to conduct the tests at sea. Any fisherman who undergoes the training will be allowed to harvest clams. DeGrasse said it remains unclear whether other parts of Georges Bank will now be opened to clamming. But she expects to see the number of clamming boats heading to Georges Bank to increase in the coming years. “Our goal was to come up with a science-based approach to protect public health from shellfish potentially contaminated with toxins, and I think we’ve successfully done that,” she said.